Discussion in 'Red Sox Forum' started by The Allented Mr Ripley, Apr 13, 2016. If you grew up reading the Globe sports page in the '80s and '90s, you knew who The Maniacal One was. He was many readers' introduction to advanced baseball statistics, and the Globe tapped him for contributions to its stellar Sunday Notes column, where he often received his own featured box. He befriended Wade Boggs and kept track of his incredible numbers through his huge years in Boston. He would often give Boggs all of the data. The big thing there was he kept up with foul-ball pop-ups, for which for many years there were none, a sign that Boggs rarely had a bad swing. He kept track of swings and misses, balls hit on the ground, line drives, averages on certain counts and conditions. They were numbers that are certainly in vogue now, but back then he was the guy who kept them. “Chuck was Bill James before we became addicted to him,’’’ said Gammons. “He would mail me lined sheets of notebook paper telling me how many times Wade Boggs popped up, or who hit The Wall how many times. I can’t tell you how many agents approached me about how they could get a hold of Waseleski. They all wanted his phone number. Before long, Waseleski started producing files for agents on their players for arbitration cases, for free agent presentations. Waseleski’s numbers became all the rage. Once cellphones came into being, he would call me in the press box if he saw something that just happened that he had a stat for. This was stuff you couldn’t get from the team that quickly, but Chuck knew the restraints deadline reporters were under and he wanted to make sure the most important number of the night was recorded in the game story. There was no way to properly repay Chuck for all he did for all us — from Gammons to Shaughnessy to the late Larry Whiteside to Fainaru to me and Edes. We feel the same way. He was often our savior. He allowed us to build stories off his numbers or at least to add something interesting that only he had the knowledge and ability to come up with. “He was obsessed with numbers,” recalled Fainaru, now an investigative reporter for ESPN. “I remember calling Chuck in real time to get something more esoteric about what was happening. I called him ‘Maniacal’ not only because of his diligence to the numbers but because it reflected how different he was. He helped shape what the sport has evolved into and it shows how influential he was. I loved his stats / misc. data that Gammons used to include in his Sunday Notes column. The Maniacal One.....won't forget his contributions any time soon. Spot on. I'm a little young for Gammon's Globe heyday, but Shaughnessy's Maniacal One tidbits were my primer / gateway drug to sabermetrics, a decade before I ever ever heard the word. I'm surprised to learn from Cafardo's article how active he still was with Boston sportswriters up until recently - you would have thought the internet put him out of business. 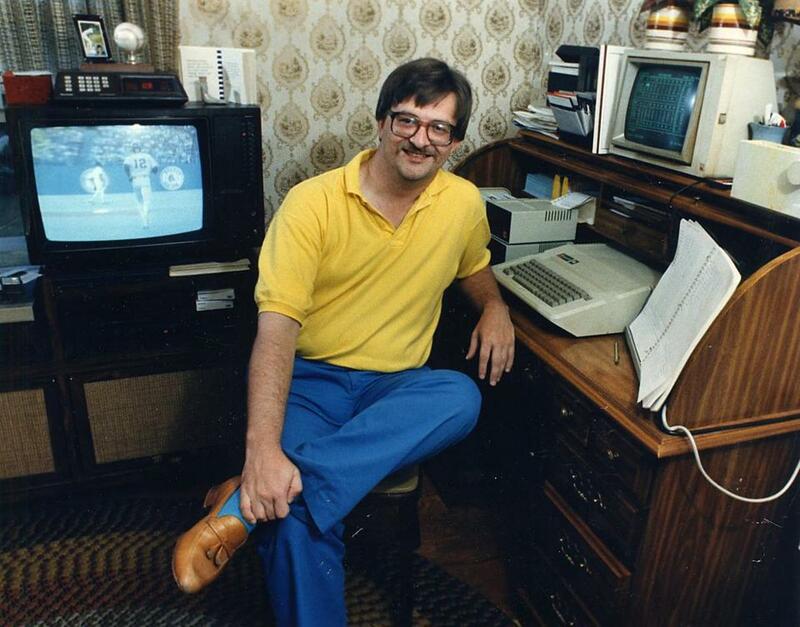 To a 10-year old obsessed with both John Valentin and Pentium chips, this picture was the height of cool. He'll never get 1/10 of fame his impact merits. RIP Chuck. In 2005, Waseleski told me Bill James included some of his data in his 1983 Abstract... and got his name wrong. The following year, James included even more of his data and spelled his name correctly, in all caps, 20 times. Interesting, and deserving, tribute by Cafardo. Let me pile on - as a kid, I looked forward to the latest "from the files of the maniacal Chuck Waseleski"... the man who got me interested in sabermetrics. That Notes column was the only reason I had the Sunday Globe delivered to me in college. ps - Is that an Ellis Burks sighting at Exhibition Stadium inside the cathode ray tube? I would wager that yes, that is Ellis, rounding the bases on July 27, 1987 at Exhibition Stadium after clubbing a home run in an 8-10 loss for the Sox. In 1985, Waseleski told me Bill James included some of his data in his 1983 Abstract... and got his name wrong. The following year, James included even more of his data and spelled his name correctly, in all caps, 20 times. Yep, the '83 and '84 Abstract info is confirmed. And I think that is an Apple III running VisiCalc! I'd always get a charge out of seeing his name referenced in a Sunday Notes column, knowing that what followed would be incredibly fascinating. 61 is far, far too young. Very sad. Pretty sure it's an Apple IIe. I will repeat the love for his work -- I waited every week as a kid for his stats on Sunday. Rest in peace indeed. Count me in. His notes in the Sunday columns started me counting pitches, noting if a pitcher was ahead or behind in the count when the ball was in play, swinging strikes vs. called strikes (and what that meant), etc. etc. Waseleski and Gammons were like Trammel and Whitaker, a sweet combination. Condolences to his family, may they somehow know the joy he brought to so many. Godspeed and RIP.